The Cranbury digital Camera Club with permission from the town of Cranbury, New Jersey, USA, and with the assistance of the Cranbury Volunteer Fire Department held the region's first-ever hot air balloon fest on a Saturday evening in mid-August, 2007. Everyone is hoping this will turn into an annual event. [Update, 2010: The club hasn't held a balloon event since this first one.] To read more about the camera club, the volunteer fire department and the town of Cranbury, click on the above links. Also the Cranbury Lions Club has a website about Cranbury. 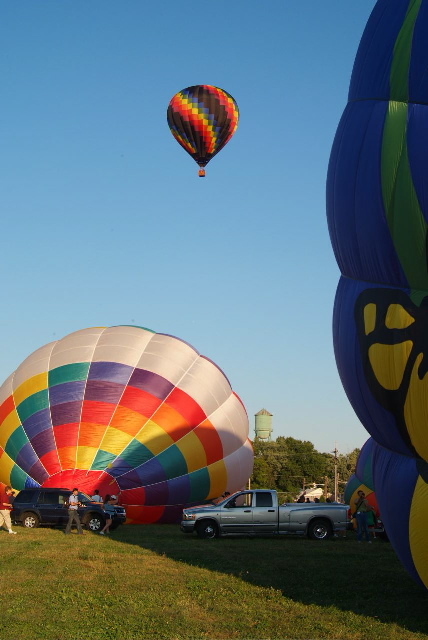 There were eight or nine balloons Saturday evening and five more flew Sunday early morning. I flew in one on Saturday evening. There were lots of people with cameras trying to get great shots of all the balloon activities. We kept getting in each other's way, too. 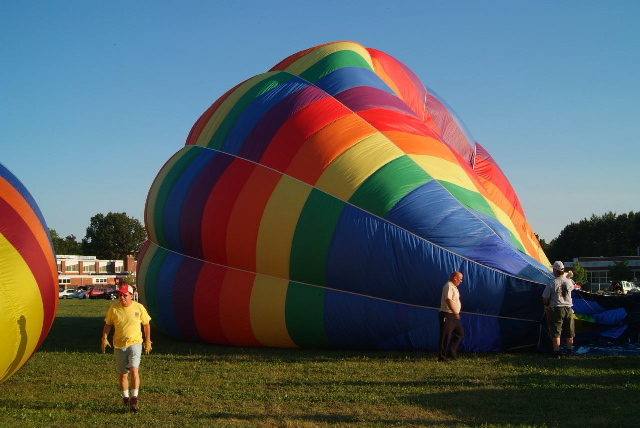 I wanted to shoot the inside of a balloon as it lay on its side getting inflated. Lots of times I'd click the shutter, only to find that someone had intruded into the picture. But I did get lots of other good shots, which you'll see below. 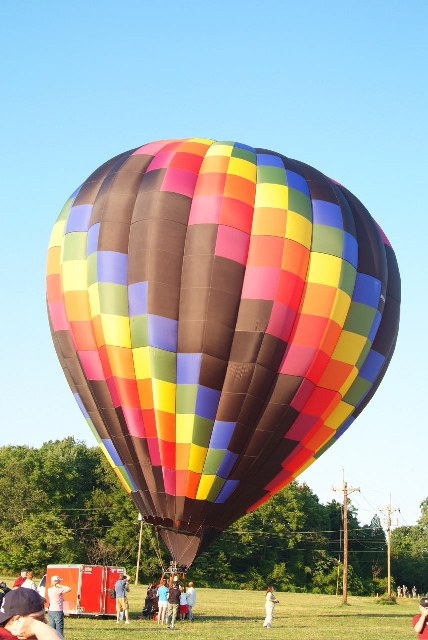 Also, I missed the balloon I was supposed to ride in, because someone else got mixed up and got into "my" balloon. So I had to be squeezed into the largest of the balloons there, the Butterfly. Its basket is large enough to squeeze in eight people, counting the pilot and his assistant! The baskets are woven from wicker, which can be either willow or bamboo. They have padded top and bottom edges, most with leather, but a few had canvas padding. The baskets also have footholds woven into two of the sides. To climb into the basket, you put your feet into these square holes, heave yourself over the top rim and drop down. Getting out, well you just do it the reverse way. It's not a very graceful process. Quite a few of us "seniors" needed some additional shoves. 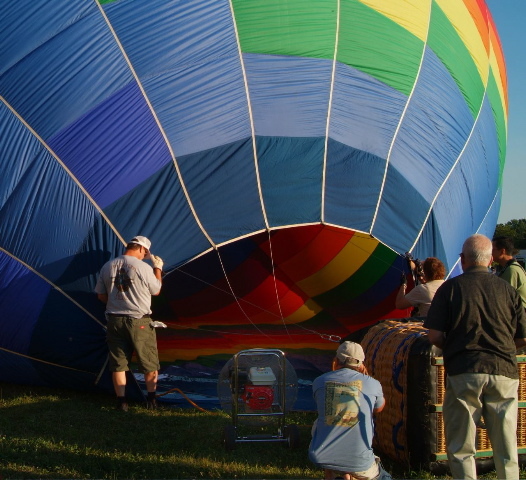 We had to wait until 6 p.m. for the balloon master to call the FAA for the weather report and a final go-ahead. 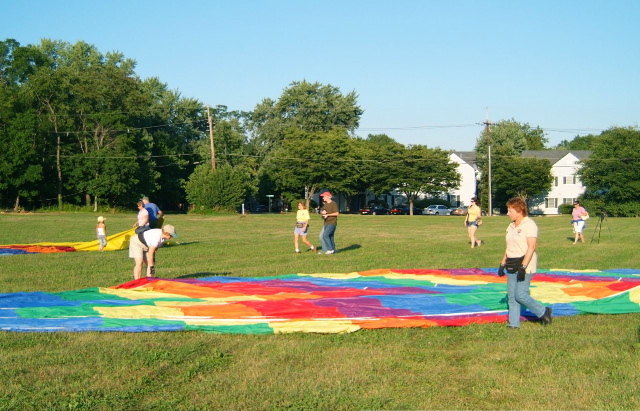 The FAA needs to know how many balloons will be in the area and probably told them what their maximum height could be. Cranbury is near the flight paths and holding patterns for Newark International Airport. The pilot of my balloon said we'd fly at about 1500 feet. We lifted off at 6:30 and landed at 7:30, having flown only a few miles. 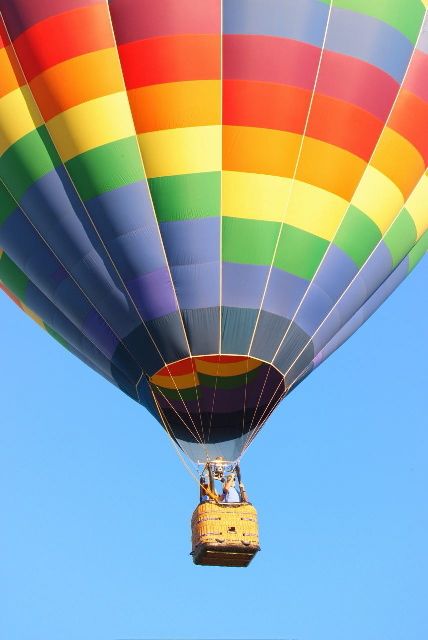 If you need to go far in a hurry, a hot air balloon is definitely not the best method of transportation! The images below are arranged in the order in which I shot them. So you'll go through a whole ride from beginning to end. Please click on the thumbnails to see a larger version. First Image: The woven basket, the footholds, the padded rim, the supports for the burner and the burner itself. 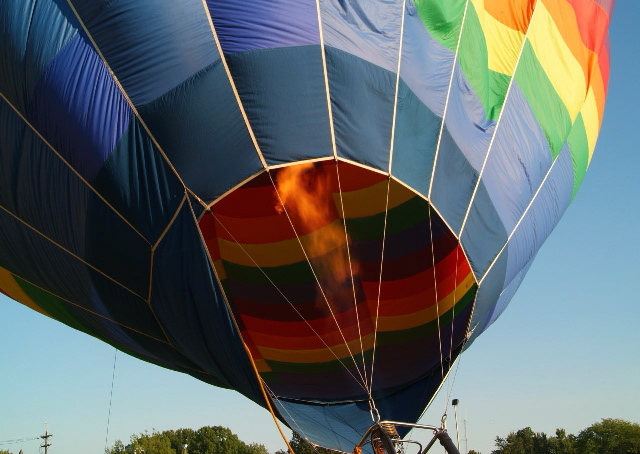 The burners use propane gas to keep the balloon inflated. Under the burner is a handle so the pilot can tilt the burner if necessary. Not showing here is a lever which the pilot pulls to shoot more flame into the balloon to heat the air if he wants to rise higher. Since the propane is compressed, when it's released, it shoots through the coils as it expands, hitting oxygen in the air and bursts into flame. So they don't have to use matches or any other form of ignition. Second Image: This small basket has two propane tanks firmly fixed inside the basket. There are dials so the pilot can check the amount of fuel and flick a switch from one tank to the other. Third Image: When each crew unloaded the baskets and set them up, the pilot would test the burner. The flames shot ten feet or so into the air with a loud "whooshing" sound. The phone pole is not on fire. That's the flame shooting out of the burner. 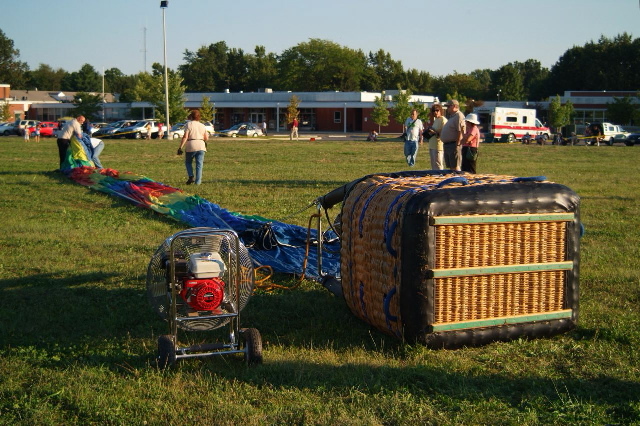 Fourth Image: To fill the balloon, first they use powerful fans that blow air inside the balloon which the crew has unfolded and stretched out onto the grass. 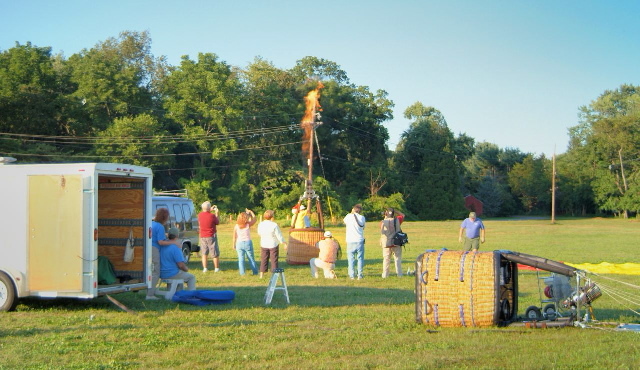 Here you can see the set up: the basket lying on its side with the burner pointed toward the balloon, the fan with its generator next to the basket and the crew unrolling and unfolding the balloon. Fifth Image: Here's one of the balloons spread out. After it has been unrolled its full length, the crew run along its sides pulling out the folds so it will open and expand easier. 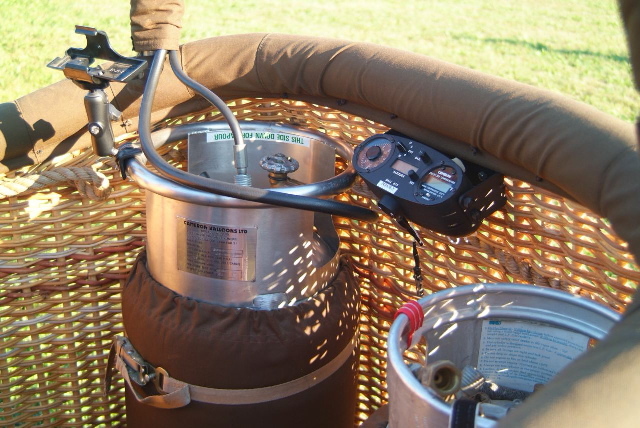 Sixth Image: The basket lies on its side with the burner pointed toward the balloon opening. Two or three of the crew pull on the ropes fastened to the lower edge of the bag. They have to lift up the opening so the air can blow into it. I didn't think one fan this size would inflate such a huge bag--but each balloon had only one fan. The fans did their jobs well. 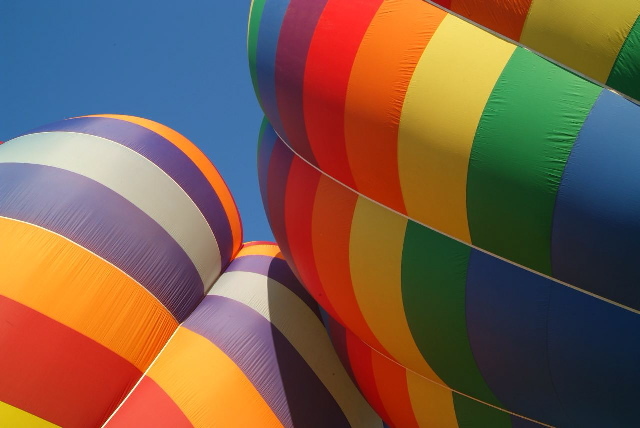 The balloons will lie on their sides until they fill with enough air to start rising. The fan has done its job and this balloon is just about ready to receive the flame from the burner. Seventh Image: I ran closer. Here you can see that the bottom of the bag is open enough so the flame can enter it safely and not burn the material. Eighth Image: From this point on, it gets tricky. The whole crew hangs onto the basket to keep it grounded as the flames heat the air and make the bag rise. The pilot climbs in first so he/she can control the burner. Then one by one the passengers are assisted into the basket. 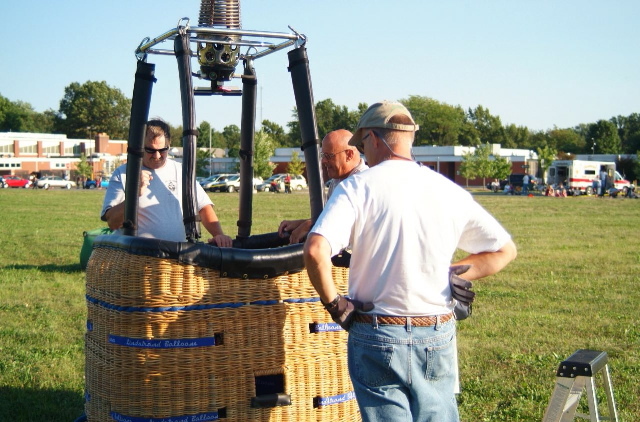 This additional weight keeps the balloon grounded until the pilot signals the crew to untether the basket. Ninth Image: Final call for passengers to get in and get settled. Tenth Image: And away they go! Eleventh Image: Two of the balloons were so close together that the slight breezes rolled them into each other before they were fully inflated. No damage done, of course. Twelvth Image: As the balloon just launched floats further away, Happy Harry's Restaurant's balloon inflates. I'm standing beside the butterfly balloon that I'll be riding in as it also inflates.